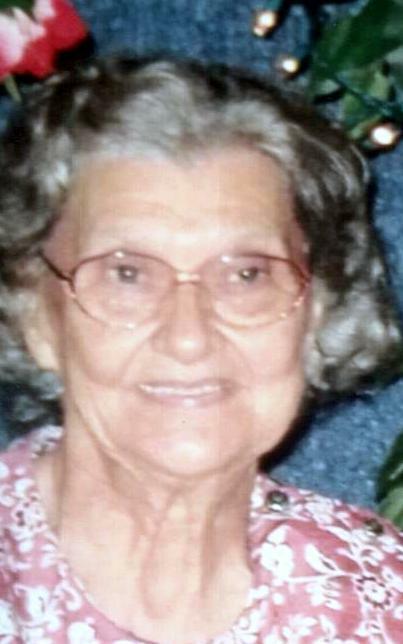 Octavia Patrick, 93, of Delphos, went home to be with the Lord and her husband Andy on Thursday, March 28, 2019, at Vancrest Healthcare Center of Delphos. She was born April 4, 1925, in Kentucky to William and Olga (Hamilton) Isaacs. She was united in marriage to Andy J. Patrick on August 28, 1942; he preceded her in death on November 28, 2017. She is survived by two sons, Andy Jack Jr. (Farol) Patrick of Elida and William “Rick” (Donna) Patrick of Shawnee; a half brother, Dan Williams; a half-sister, Jackie (Bob) Hahn; four grandchildren; and 14 great-grandchildren. She was preceded in death by a grandson, Adam Patrick; two sisters, Nova Moore and Malissa Casey; half brother, James Williams; and half sister, Anna Sue Osborne. She was a member of The Church of God Church in Freemont and loved the Lord with all her heart. She had worked at Pangles Grocery store in the produce department for 28 years. Octavia loved to crochet, work on flower arrangements, and spending time with her family. Funeral services will be on Monday, April 1, 2019, at 11:00 a.m. with viewing one hour prior to the service at Harter and Schier Funeral Home. Burial will follow in Greenlawn Cemetery. Friends may call on Sunday, March 31, 2019 from 4-6 p.m. at the funeral home. Memorial contributions may be made to Alzheimer’s Association.